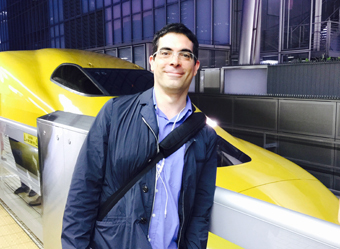 Ramsey Zarifeh (right, beside the line testing and diagnostic shinkansen known as Dr Yellow) was born in the UK but has spent most of his working life abroad. Graduating from Magdalene College, Cambridge, he spent two years in Japan on the Japan Exchange and Teaching (JET) scheme, before writing the first edition of this book. He currently works as a broadcast journalist, and his travels take him as often as possible back to Japan. In 2015 he presented Off the Rails, a documentary for Al Jazeera on Japan’s love affair with its train network. He is the author of Japan by Rail.